If you rent or own a home, yard maintenance is a priority. 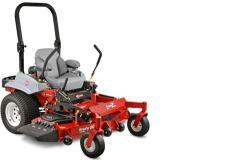 Think of maintenance on your Exmark mower as a necessary part of your yard maintenance duties. Not only will taking care of your Exmark mower ensure great performance, it can prevent expensive damage to your equipment, and prevent an injury to the operator. Before starting any of the next tips for keeping your Exmark mower in good working order, ensure that the engine is turned off prior to beginning. If the mower is key operated, remove the key after turning off the engine. If the mower is not key operated, remove the spark plug wires to ensure that the mower has no power supply. Also, ensure that the engine is cool before starting any maintenance. Keeping your Exmark mower clean is probably one of the easiest ways to maintain your mower. Always check the operator’s manual to ensure that you don’t use any products that might damage your mower during cleaning. Avoid using water for cleaning purposes as it can compromise certain parts of your mower. Using an air compressor for cleaning can help to avoid this problem. It’s very common for debris to get caught under the mower. Check under the mower and free any debris from around the blades. In addition, remove any debris from the deck shield area. There are two options for cleaning debris. Manually (by hand) which is fine for small amounts of debris or quick clean up, or use an air compressor to remove the debris. Use the compressor at all of the exit points underneath the mower, around the screws and around the blades. Once completed, ensure that the blade is freely moving – do this by hand and don’t start the mower while you’re cleaning it! The pumps and wheel motors will also need to be cleaned off. Because of their potential exposure to oil, the debris in this area can get stuck. This is due to the heat it’s exposed to, and can cause damage to the pumps and wheel motors. Cleaning this area each time after you’ve used your mower or prior to the next use will extend the life of this area. Grease: There should be a certain grease level on your input and output shaft bearing for the transmission. The gearbox should contain about 1 and 1/2″ of Peerless grease (Peerless transmission gets Peerless grease), or a compatible grease. Lubrication: There are a number of areas that should be kept adequately lubricated. Some areas should be lubricated every 40 hours, while others only need attention yearly. Always refer to the manufacturer’s operations manual to determine the lubrication quantities. Air Filters: Replace – do not clean, air filters when they are dirty. Check both the inner and outer air filters after every 50 hours of use. Fuel Filter: Different mowers have slightly different specs, in most cases you should change the Exmark fuel filter after every 25 hours of use (stop and start use). If the mower is not used that often, change the fuel filter once each season. How often you need to change the spark plugs really depends on mower use as well as exposure to the elements. The manufacturer recommends checking your spark plug every 160 hours. All of the signs that indicate a dirty air filter, can also apply to bad spark plugs. If you’re experiencing any problems with engine performance, replace the air filter before considering a new spark plug. Ensure that the torque levels on the different parts are appropriate for safe use. Refer to the manufacturer’s operations manual for your specific Exmark mower. To easily find Exmark mowers and mower parts from a certified Exmark dealer, visit www.ShanksLawn.com. Since 1984, Shank’s Lawn Equipment has provided thousands of people with the best outdoor power equipment on the market. If you’re in the Chambersburg, PA area or Hagerstown, MD and need service for your Exmark mower, be sure to stop by Shank’s Lawn Equipment. This entry was posted in Uncategorized and tagged Exmark, Lawnmower, Maintenance. Bookmark the permalink.